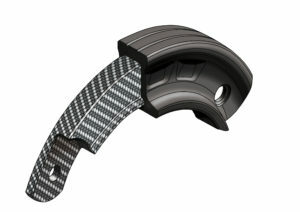 A lightweight carbon fibre rubber runflat is on display on stand D 62 at MSPO, being held at Kielce, Poland. The Tyron Carbon-ATR, which achieves up to 50% weight reduction, has successfully undergone initial trials. During the trials the runflat was put through a series of events to confirm that the design of the runflat was able to withstand the effects of off-road driving as well as driving on tarmac. “We have worked hard exploring the use of new materials to save weight. This is being driven by the changes in military demands for rapid deployment and in a lot of cases amphibious capability. The Carbon-ATR achieve this weight reduction significantly, for example on an 8×8 on 1400R20 tyres, the minimum unsprung weight reduction for the vehicle compared to our steel insert ATRs so far is 240kg and we expect to improve this still further,” said Mr Glazebrook, Chief Executive of Tyron Runflat. “Reducing the weight on an armoured vehicle is the goal of all vehicle designer’s, as lower weight means increased mobility and better fuel economy” added Richard Glazebrook,. Tyron runflats have a patented core to give it strength and a frame to maximise the performance of the rubber, the Carbon-ATR uses a carbon fibre core, which reduces the weight while maintaining its strength. Tyron’s runflats are unique in that not only are they manufactured from rubber, their multi part design makes it easy to change a tyre on the side of the road without special tools, the weight reduction of the Carbon-ATR makes this even easier. Tyron’s runflats have been proven to easily exceed the Finabel standards and can keep going at over 50kmph for distances in excess of 100km.